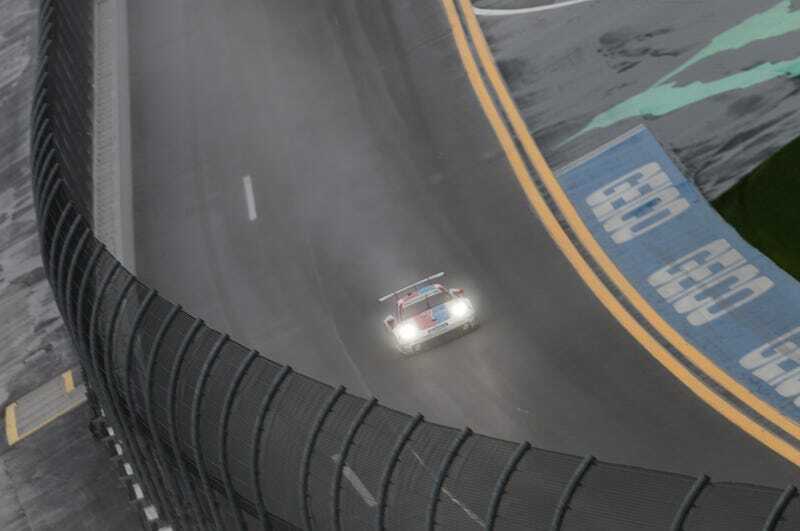 The morning hours of Sunday at the Daytona 24 Hour race have been defined by huge swathes of full course yellow driving while the rain falls. It’s really nasty wet out there, and there’s no telling when someone else will wreck in a hydroplaning incident. There have been a number of spins, big hits, and cars taken out of the race as a result of race control sending the race back to green prematurely. It’s dicey, and it’ll certainly be a race of who can tiptoe around in the wet as quickly as they dare. Kurt Bradley is still out there in Daytona trying to keep himself and his camera equipment dry in the Florida downpour, shooting all of the racing action for Jalopnik. Here are a few of his mid-morning shots as the race winds down to its end. As things sit right now, Felipe Nasr leads in the Action Express Racing Cadillac with Fernando Alonso charging hard to re-take the lead with 2 hours and 15 minutes remaining.